Visual effects can often make or break a film. 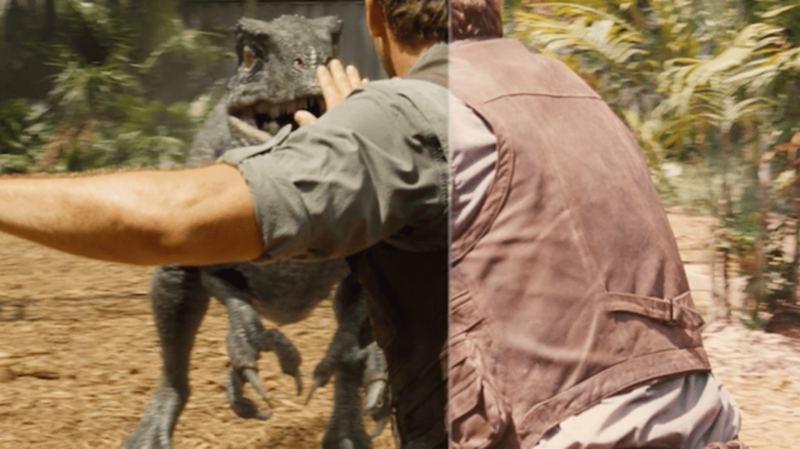 Recognizing the difference between amazing effects and terrible ones is pretty easy, but most people rarely see a side-by-side comparison of what a film looks like before the digital magicians step in and work their moviemaking magic. Check out the clips below to see just how essential these VFX artists are to today's cinematic landscape. Chris Pratt is charming, but without these visual effects, Jurassic World probably would not have made the humongous splash that it did at the box office. This film takes place in a real location in the past, so the visual effects artists were tasked with building a digital time machine to restore New York City landmarks (including the Twin Towers) to what they looked like in the 1970s. Combining motion capture and some truly stunning visual effects, Image Engine turned a film with very little critical support into something worth seeing. Making giant military vehicle explosions in the sky look remotely realistic is no easy task. This clip from the Captain America sequel also shows how the characters were able to swap faces. This entire film is a showcase of impressive effects work by visual effects supervisor Chris Godfrey and Animal Logic. We're not even sure whether Leonardo DiCaprio was there at all. You may not have realized that a lot of the landscapes and architectural elements of this Martin Scorsese film were digital creations. Which means that Brainstorm Digital did their job well. Though reviews on the film were mixed, there's no denying that Pacific Rim was a visual feast, as evidenced by the number of visual effects award nominations it received, including six from the Visual Effects Society. Another Academy Award-winning display of talent, this time by Australia-based Rising Sun Pictures. The clip above from the "reentry sequence" comes with audio commentary to explain exactly how the effects were achieved. Bill Westenhofer, Guillaume Rocheron, Erik De Boer, and Donald Elliott won the Academy Award for Best Visual Effects for this film in 2013. Even the two-minute clip above makes it easy to understand why. Hulk smashing all over a crumbling New York City is not something that Mark Ruffalo can take credit for. This movie (and most of the other superhero films of the past couple of decades) would be unwatchable were it not for these kinds of mesmerizing effects. An unfinished cut of this film famously leaked online and a lot of people got to see behind the curtain. The clip above shows some of that early footage, alongside the completed footage. It turns out that Hugh Jackman's muscles are real.